This short story was written for Notting Hill Games for the IRPMUS Kickstarter Campaign and the improv performances, incorporating the more unique elements of RPGs and LARPs. The Treant bent forward, bellowed out a grunt of boredom then picked randomly at the white, lacey frills stitched to the bottom of his silk dress. He sighed, slouched back in the chair and ran his knotted fingers through a green, leafy patch of unpruned growth sprouting from his head. “How much longer?” the Treant asked as he flicked away random insects that scurried between his lanes of tightly woven bark like cars on a bustling freeway. “This shouldn’t take more than an hour,” replied the Pixie Bard Dentist with an ear to ear smile. The room buzzed with a song of determination; the Pixie’s wings beat in harmony as he packed the Succutaur’s mouth with dental cotton rolls. The Treant watched with feigned interest as the Pixie lowered his glasses to the end of his nose and searched for any remaining vacant space in the Succutaur’s mouth. “Pmskkw sdkau sialsicm,” added the Succutaur, spitting a few cotton rolls from her mouth. “Please don’t talk!” scolded the Pixie in the ear-splitting, high-pitched tone they’ve all grown accustomed to. “Cotton isn’t free!” He fluttered down to the floor, gathered the jettisoned cotton rolls and tucked them, one by one, under his arms like firewood. “I don’t know how much longer I can do this,” the Treant sputtered, leaning his head against the wall with a thump. Not expending any more effort than he needed, the Treant rolled his eyes from side to side. The Pixie Bard Dentist, Succutaur and the Zombie Janitor were the only other creatures in the one-room dentist office. “Can’t you make some money off of him?” the Treant asked, lancing his finger at the zombie. All eyes in the room shifted to the Zombie Janitor. He stopped gnawing on the mangled handle of the push broom and belted out an UUUUAHHHHHH in response. Shards of splintered wood jutted haphazardly from his lips and face like quills from an exploded porcupine. The zombie paused in silence for a few moments, poked at his sagging arm muscle that was sloughing off the bone, then continued his chewing. “Whatever.” The Pixie scrubbed the back of his head until his salt and pepper hair was a tangled mess. “What do you want me to do? Throw my brother-in-law out in the street!? My wife would never let me live that down.” The Pixie muttered something under his breath and flitted over to the nitrous canister. Using his tiny hands the Pixie loosened the valve and draped a large plastic mask over his body, engulfing him to his knees. The tips of his tube socks flapped violently as the gas hissed around him. “Isn’t that for the Succutaur?” The Treant asked under a furrowed, leafy brow. Thump! The Treant’s head struck the wall behind him. As he shook his head from side to side chunks of plaster and paint flaked from the wall, scraped free from an array of wild twigs and branches. “It’s out there you know? The Rainbow Unicorn Kitten. Who knows what untold horrors it’s planning for us? The destruction. The devastation.” A shower of leaves rained from his body as the Treant openly shuddered at the thought. “UUUUMRPMMPHHHH,” moaned the zombie. His raisin like eyes followed the paths of the twisting leaves as they sailed gently to the floor. A glob of goo dripped from the corner of his mouth and hung near his waist before it finally broke free and splattered into a sickly green pool at his feet. He shambled forward, sweeping the leaves, goo and pixie dust into a tidy pile. 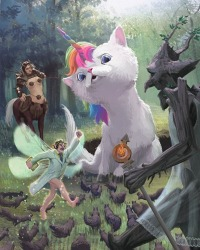 “Disddisok uslixkdie!” mumbled the Succutaur as the Pixie fluttered in medicated panic to secure the cotton rolls. She removed a scroll from her side-slung satchel and rolled it open on the floor. Once the cotton rolls were back in place the Pixie burrowed himself underneath the mask and took another shot of nitrous, while the Treant just closed his eyes and grunted his response. “Mns iedonx uwlxi aise!!! !” The Succutaur involuntarily bit at her bottom lip in anger, but only managed to make a sucking noise from her puckered fish lips. The horsehair on her back bristled to attention as she stomped her hooves then balled her fist and shook it in the air. “Huh?” the Pixie said from his seated position; his legs were splayed in opposite directions and the chair’s backrest pushed his head into his chest. His wings were bent and folded underneath his stained lab coat and his glasses were askew on the end of nose. The sock loosened from his left foot and was dangling over the edge of the chair. “MMMHHHMMMM,” the Succutaur added with a sharp nod of her head. A bone-shattering snap rang out from behind. The Treant turned and watched as the Zombie’s right arm went limp, sagged at his side then dropped free from his shoulder and crashed into the pile of pixie dust. A sparkling pink cloud billowed throughout the room. Copyright © 2018 Donald Schlising | All rights reserved.